There was nothing we disliked. The 'likes' are numerous and include the view was awesome, our Cave Home was immaculate and spacious, our host Christina was lovely and always (always) available for advice and assistance with outings and restaurants and such, and lastly The last location is perfectly situated near the heart of the town. We would never stay anywhere else. The Aris Caves is a fairytale come true. The view from every balcony is simply amazing. I would write down all the details that made the stay so amazing, but there are just too many. We will go back to stay again for sure! Christina (the owner and host) thought of everything! She arranged all our transportation, dinner reservations, catamaran cruise, luggage transport...you name it, she did it. I will be sharing this hidden treasure to everyone I know. It was clean. Comfortable stay. Christina the host was very helpful and available to address our needs during our stay. They gave us cake and wine and water and tea and coffee which was very considerate. Also there was always hot water which was nice. Daily housekeeping was a pleasant amenity as well. Aris Caves is wonderful! The property is quaint and impecably maintainted and the unobstructed views are some of the best we have ever experienced. The common patio is perfect for a glass of wine while over looking the caldera. Most impressively, Christina (the host) went out of her way to organize transportation, make reservations, and provide great insight on the area. Thanks Christina for making our stay perfect! The location was perfect ... everything was super near: restaurants, super markets, bus station, car rental, etc.. The host was fantastic. Christina operated as a tour guide for me showing me where I should go and giving me very useful tips. She was very focused on every single detail of my stay and my Santorini experience. The room was georgeous, with everything you might need. Excellent Wi-Fi connection. Zero noise so you can sleep very well. The view from the hotel was breathtaking. The sunrise was absolutly perfect. I highly recommend this hotel. I will definitely come back. Our room was beautiful, quiet, and very comfortable, with a small terrace and a jacuzzi both overlooking the caldera. Our host Christina was very friendly and welcoming, and provided us with many great restaurant recommendations for lunch, dinner and breakfast. She was also very efficient in providing helpful information both before and after our stay. The views were spectacular. The villas were very clean and comfortable. The hostess was very helpful and she was able to provide us with a number of options for activities, and places to go. She also booked us on a sunset cruise which was one of the highlights of our holiday. A friendly and effficent service from all the staff from the word go, everything was made very easy form the time of booking last September to the day we left. Christina was available via email at any time. Just a few examples of this service and efficiency were... Christina emailed to ask if we needed her to book airport transfers, the porter greeted us on arrival and carried all our luggage down to our accommodation and the cleaner went out of her way to accommadate all our requests. The towels were white and fluffy, the free toilets were of the best quality, there was even a chilled bottle of white wine in the fridge when we arrived. It truly is 5 star customer service! Christina is a fantastic host and would go above and behond to make your stay memorable. As for the location it's 10 out of 10 - Aris Caves is placed in the heart of the cliff with stunning views. The views from the property and terraces were amazing! Apartment was very clean and excellent decor, air conditioning was brilliant owner and cleaner and porter all very friendly and helpful. The apartment was in a great location with quite a few steps to be climbed to great restaurants and lots of shops. It was lovely to arrive to a cool apartment met by Christina the owner. A gift of wine, cake and olive oil was a lovely touch. Coffee, tea and basics all supplied! Porter was waiting for us when we arrived and carried all our bags to our apartment the service was excellent. Spectacular view of the caldera! Our room was spotless and thank you Christina for arranging our transfers. Special thanks to the porter who managed all our luggage up and down the steps! Lock in a great price for Aris Caves – rated 9.6 by recent guests! Aris Caves This rating is a reflection of how the property compares to the industry standard when it comes to price, facilities and services available. It's based on a self-evaluation by the property. Use this rating to help choose your stay! Carved into the volcanic rock, facing the Caldera, Aris Caves offers self-contained accommodations with breathtaking view over the sea. Free luggage porter service is provided. Aris Caves offers furnished rooms, each with its unique decorative features. All units are air-conditioned with kitchenette with fridge, coffee maker and toaster. Amenities include free Wi-Fi and hairdryer. Oia center is a 5-minute walk. Guests will find restaurants and bars, only 350 feet from the complex. Guests are greeted with a welcome pack with area maps, restaurant suggestions and more. Free public parking is available a 5-minute walk away. When would you like to stay at Aris Caves? Traditionally furnished studio with domed ceilings featuring a kitchenette, seating area and a patio. 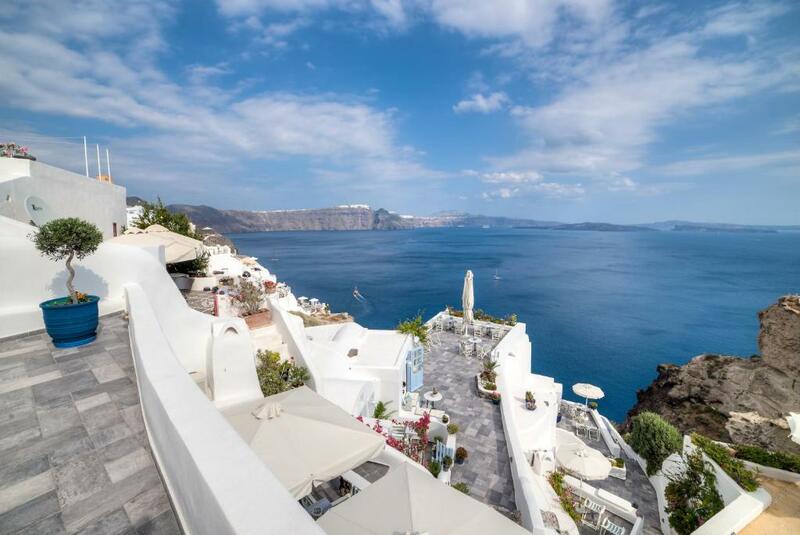 Opening to a large terrace with full views to the volcano, Caldera and the Aegean Sea, this studio consists of a bedroom with seating, kitchenette and private bathroom. A hot tub is also available. Fitted with a domed ceiling, interior archway and stone-built beds, this traditional apartment consists of a separate bedroom and seating area with a kitchenette. It opens out onto a furnished terrace. Offering a wooden gallery, this spacious suite consists of a loft bedroom, master bedroom with attached bathroom with double bed, and living area with double bed, kitchenette and sofa. It opens out to 2 furnished terraces, one larger than the other. Built directly into the hillside, this spacious studio has a private, cave hot tub, an open-plan living area with double bedroom and kitchenette. Offers a private courtyard and an elevated, private, spacious and furnished terrace. Features wooden gallery with 2 twin beds and a double bed, this split-level apartment offers a seating and dining area. Includes a kitchenette and opens out to a furnished terrace. 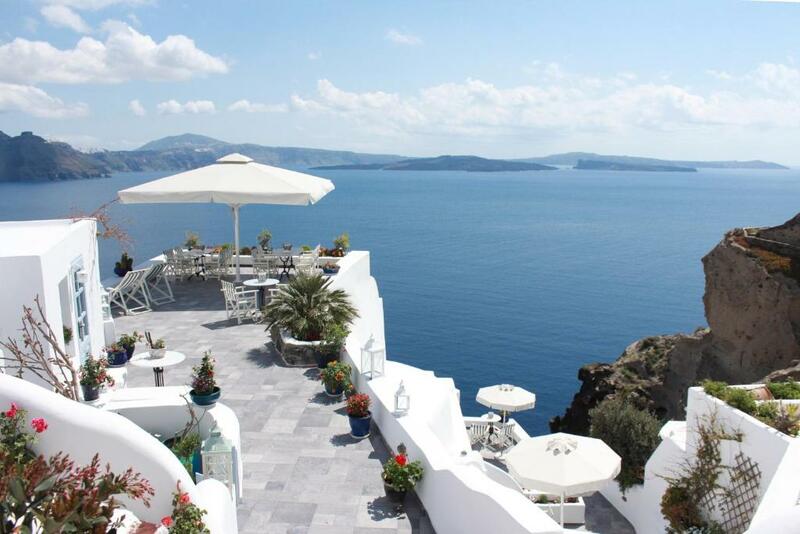 Many years ago caves were discovered on the cliff side (Caldera) of Oia in Santorini. Archaeologists identified them as ancient cave houses and lodgings. 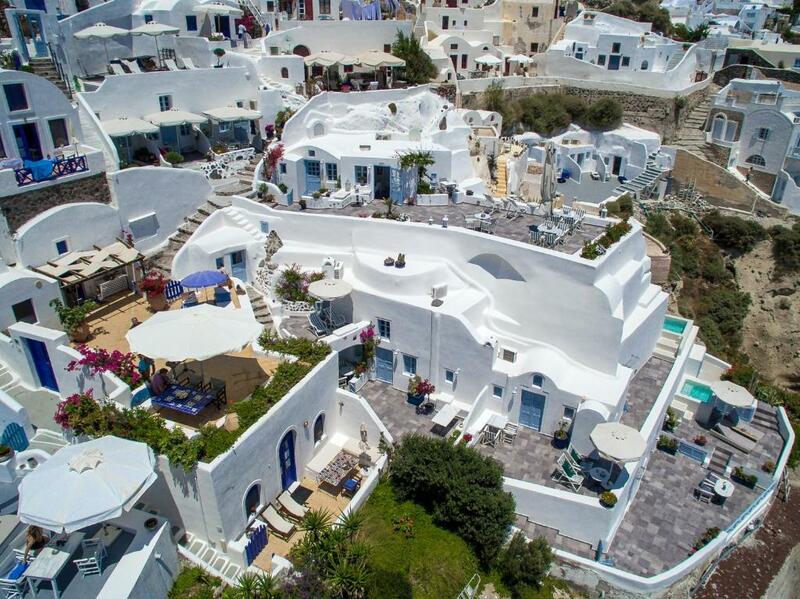 Some of these cave dwellings were transformed into the Hotel ARIS CAVES, a small and intimate boutique hotel. I have always loved traveling and exploring different cultures as well as meeting people from all over the world. Hence I decided I would love to work in the hospitality sector and specifically manage a small hotel with a commitment to excellent service. I was lucky to find Aris Caves and my new goal is to always strive to surpass my guests' expectations. House Rules Aris Caves takes special requests – add in the next step! Aris Caves accepts these cards and reserves the right to temporarily hold an amount prior to arrival. Guests should note that due to the hotel's cliff-side location and low perimeter walls, the hotel is not suitable for young guests below 8 years old and people with mobility issues. Guests are requested to inform the hotel in advance of their estimated time of arrival. This can be noted in the Comments Box during booking or by contacting the hotel using the contact details found in the booking confirmation. 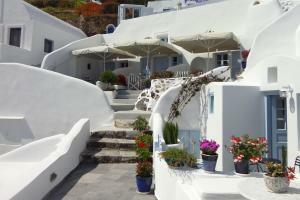 The hotel is happy to arrange transportation from Santorini Airport and/or Port. Guests are requested to inform Aris Caves in advance if they would like to use this service. The hotel was hard to find and Google Maps didn't help, just make sure you call the owner to get proper directions! No nothing really. We may select a villa with a bigger pool next visit, but this was not the be all and end all. The non-flushing of toilet paper down the toilet was a bit strange at first, but we got used to it. There is no pool in the hotel There is no TV I hit my head many times when going up cause the ceiling height is very low. There is no breakfast. in addition to the high room rate, I had to buy breakfast. Nothing, there is not one thing we can honestly say we did not like about the location or our choice of accommodation. Probably less steps would have been helpful but then you wouldn't have got the fantastic views. Matches for candles and lanterns supplied would have been great! We don't smoke and kept forgetting to buy some. We often sat on the communal terrace to drink or eat late in the evening so the lanterns would have been great to use! Maybe matches or lighter supplied with groceries would be useful. The view was amazing. Private, away from the tourists. Room was spacious with a well designed bathroom. Main area had a ceiling fan as well as aircon. The wifi reception was excellent and didn’t ever drop out. Our own outdoor spa was a big plus. Christina, the owner, was very personable and gladly booked restaurants and made suggestions on places to go. Prepare for the stairs. ~100 steps to get to my room. The obnoxious people from other hotels trying to tell us there accommodations and hotels are better than Aris Caves. The green light that stays on in the corner of the room at night, maybe it could be covered with something so it's dark. Gorgeous, clean and comfortable room and loved the private jacuzzi! Happy we had a little kitchenette too. Christina and the staff were always so friendly and helpful, whenever we needed something they were onto it! Very central to Oia. I stayed at the two bedrooms suite with total 4 beds + balcony and jacuzzi overlook the cliff. The price is amazing and Christina was extremely helpful.